Software development can be unpredictable; it’s as much art as it is science, which is why release dates are so often missed in this business. Even still, Feral Interactive took too long to get Fable: The Lost Chapters out on the Mac-they first announced it in mid-2005. It’s a fun action/role-playing game romp, though it is showing its age. 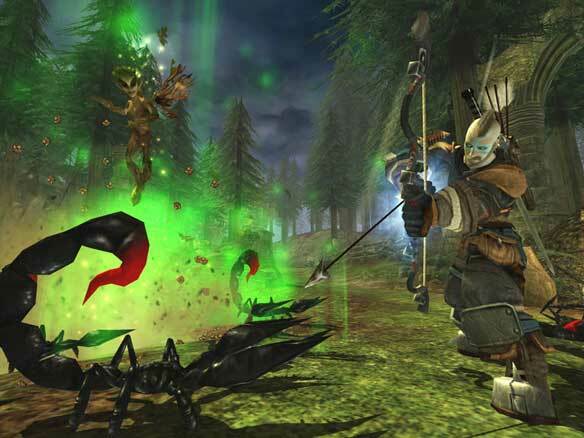 Fable was originally developed for the Xbox and PC by Lionhead Entertainment, home of famed game designer Peter Molyneux, the brains behind legendary “god games” like Populous and Black and White, as well as previous Feral releases like The Movies ( ). Molyneux’s games often deal with the balance between good and evil, and the choices that we make that take us down one path or the other. Fable is no different in that regard: In this RPG, the choices you make directly affect your character. Unlike many RPGs, you don’t start out creating a character with a profession—no level one half-elf lawful evil rangers here. You’re only allowed to play as a male, and as you play, you can decide what your character’s strengths will be, determining for example if they’ll be better and wielding swords or shooting arrows. Again, this will even affect your character’s physical appearance. Emphasize melee combat such as swordfighting early on, and expect to appear more heavily muscled and scarred. Focus on crossbows and expect to have a leaner physique. Focus on magic, and find yourself ultimately covered in arcane tattoos. Eat and drink to excess and develop a gut. It’s quite remarkable. You can even develop friendships and fall in love; there are dozens of hours’ worth of quests and missions to go on; you can also boast of your skill and accept challenges that will give you special rewards. The game has branching endings depending on what alignment you prefer and a few alternate missions you’ll be tossed if you go down the path of good or evil as well, so there’s a little replay value, though not a lot. Good or evil: Alignment is up to you, and is judged by your deeds throughout the game in Fable: The Lost Chapters. The voice acting quality is fine, and like many of Lionhead’s games, Fable: The Lost Chapters is rife with humor. Occasionally that humor crosses the line to ribald or rude. Between that and some of your abilities when you’re following the evil path (killing innocents, including your own family), this game isn’t suited for kids. Because Feral is a U.K.-based game publisher they went with PEGI ratings (the European equivalent to the ESRB), which suggested ages 16 and up. I’d say that’s appropriate. (The game’s ESRB rating is M for Mature). Because the game has been out so long for the Xbox, it’s trivial to find it in used game stores for only a few dollars. Feral’s selling the Mac version for $50. I understand they need to recoup development cost, but that is unquestionably going to negatively impact the value proposition for many gamers, unfortunately. Fable: The Lost Chapters has been a long time coming to the Mac, perhaps too long. But action RPG fans who haven’t yet played it will be rewarded with dozens of hours of entertaining fun.